Unlike other schools it is not what we say, it is what our credentials certify. The Secretary of Education of Mexico is the Mexican federal government authority with Cabinet representation and responsibility for overseeing the development and implementation of national educational policy and school standards in Mexico. In Germany, the institution of Bildungsurlaub allows employees from any sector to apply for up to an extra 10 days of educational leave that in turn is devoted to advancing foreign language skills abroad. In order for a client to be able to spend his Bildungsurlaub at a school, the school must be recognized as a Bildungsurlaub centre by a German state authority. The DELE is the sole standardized accreditation system for Spanish as a foreign language students accepted in over 100 different countries around the world. This certification is granted by Spanish Ministry of Education, Culture and Sport through the Instituto Cervnates. A DELE diploma provides the beholder with an accredited level of competence and mastery of Spanish. This provides a valuable platform of international prestige for all those who wish to work or study in a Spanish speaking organization and environment. The CENNI is an official framework recognized by the Secretaría de Educación Pública (SEP) in Mexico. It is divided into eight levels and twenty sub-levels to measure language mastery and is benchmarked against the Common European Framework of Reference for Languages (CEFR) and the Canadian Language Benchmarks (CLB). A SRC is a company that is truly committed to the harmonious coexistence and welfare of all of its acting members, striving to reach the outmost in quality and human values. Is the world's largest association of travel professionals. Members include travel agents and the companies whose products they sell such as tours, cruises, hotels, car rentals, etc. They are the leading advocate for travel agents, the travel industry and the traveling public. Is an independent nonprofit organization with no political affiliations. American Chamber/Mexico was founded in 1917 and today brings together more than 1,500 companies from the United States, Mexico and other countries. It covers all sectors and sizes, as well as more than 10,000 high level executives. Members account for almost 70% of direct investment in Mexico from the United States. The mission of AmCham is to serve its members by influencing public policies in Mexico and in the United States, promoting trade and investment, and fostering a socially responsible business environment. CASLT was established in 1970 and has evolved from a small organization of volunteers dedicated to supporting second language teachers into a multi-level organization. These second languages encompass both official and international languages. The world's largest network of youth and student travel operators. WYSE Travel Confederation is a not-for-profit association dedicated to supporting the global industry and connecting the organizations that serve millions of young people who travel to study, work and grow. For the past 60 years, ISIC has been the world's number one student identity card. Purchased by more than 5 million students each year, ISIC offers exclusive access to more than 40,000 discounts and benefits worldwide. Microsoft, Pizza Hut, Best Western and STA Travel are just some of the global brands working in partnership with ISIC as benefit providers and issuing agents. WYSE Work Abroad is the leading global forum and trade association for organizations involved in all aspects of work abroad, volunteer, internship, and work & travel programmes. Membership is open to specialists and companies actively offering work abroad programmes. WYSE Work Abroad is a global not-for-profit organisation and sector association of the World Youth Student & Educational (WYSE) Travel Confederation. 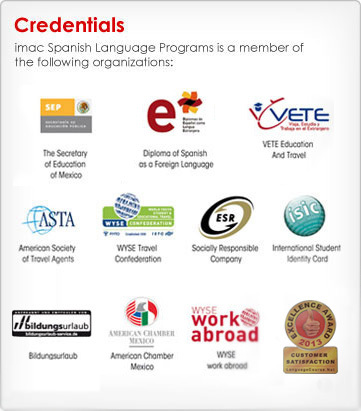 VETE Education and Travel programs. 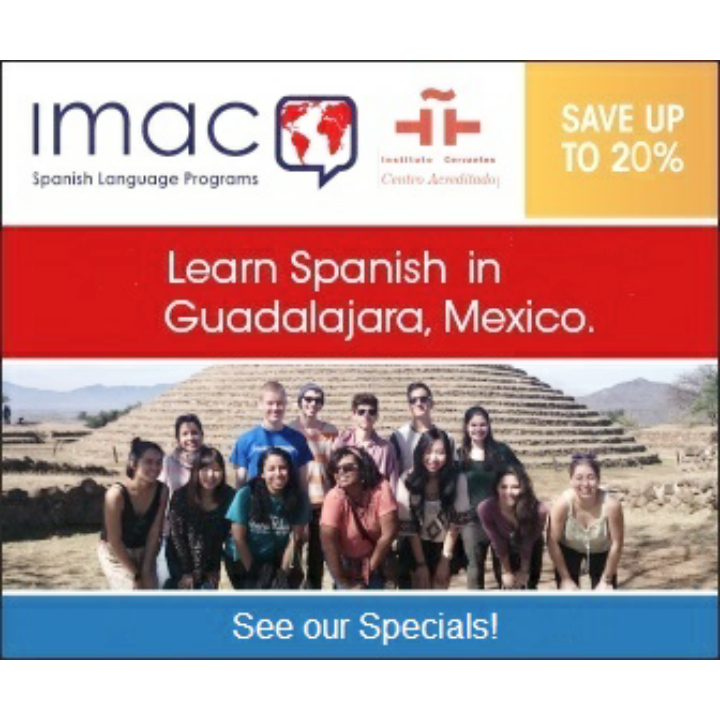 IMAC Spanish Language Programs in Guadalajara, Mexico has been granted the Excellence Award 2013 from LanguageCouse SL. Every year LanguageCourse.Net request reviews from more than a thousand language students worldwide. In order to honor language schools which provide outstanding services LanguageCourse.Net presents an annual Excellence Award only to those language schools which received the highest customer satisfaction ratings worldwide. In the end one of the most important criteria for the quality of a language school is the level of customer satisfaction! We thank all of our students for this award.